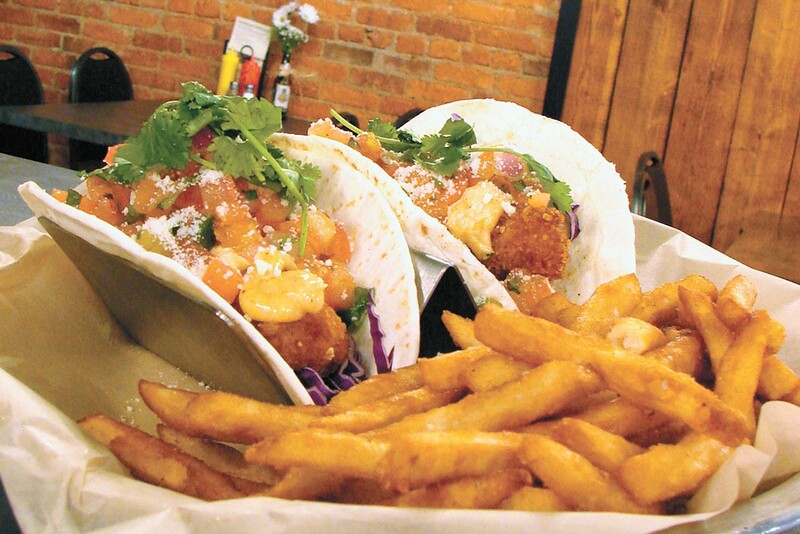 The Main Street Tacos with fries. First it was robbed of its original name (Westwood), then it was robbed of its status as county seat (which moved to Coeur d'Alene in 1908), but Rathdrum, Idaho, is nothing if not scrappy. Many businesses, including the new Westwood Brewing Company, embrace the town's roots in railroading, mining and logging while breathing life into its historic downtown. Although Westwood Brewing launched as a full-service bar in April 2017 and expects to have the brewery up-and-running later this year, the establishment is enjoying well-deserved success with locals and out-of-towners alike since adding a full-service kitchen last November. It's a ball-cap-and-boots kind of place where families, a table of well-dressed women, a few couples of varying ages and an affable group of old-timers might be found on any given evening. Start with one of 16 local and regional beers on tap from breweries including Spokane's No-Li Brewhouse or Bend, Oregon's Boneyard Beer, and an appetizer like the hearty, smoked bacon mac 'n' cheese egg rolls with barbecue sauce ($6). Westwood's version of poutine pairs crispy fries with cheese, gravy, bacon, jalapenos and cornmeal-battered garlic cloves ($8.50). Sandwiches range from beer-braised bratwurst served as a Reuben with Swiss cheese, sauerkraut and Russian dressing ($9) to smoked turkey with bacon, roasted red pepper pesto and arugula on grilled parmesan sourdough ($12). Burgers are flavorful, from the Apple-Jacks with apple chutney and brown whiskey sauce ($13) to the spicy HellFire burger with grilled pineapple, ghost pepper aioli and house-pickled jalapenos ($11). Saturday night means a classic going-to-town dinner at Westwood: a 12-ounce prime rib with a baked potato or fries and veggies ($19). The original print version of this article was headlined "Western Ideal"